***I was sent a Cumulus9 Island Runner for a feature here on Momma Told Me, no further compensation was provided. Regardless, all opinions and images are mine, and mine alone. Momma Told Me: My aching feet! As a child I remember I was ultimately in awe as to just how much work Momma did around the house; like the Energizer Bunny, she kept going, and going. But Momma's feet weren't those of a faux fur covered plastic rabbit, and she had to rely on her own determination to push through when fatigue set in. The amount of time Momma actually spent sitting, when we were home, barely registered in my memories. The place she spent the most time was, of course, the kitchen. If I didn't know better, I'd have called it the heart of our household. The kitchen was more than just a replicator for foods, but also where the family calendar was kept, the location of the nook where I'd do most of my homework, and the perfect distance from the living room TV to watch soaps while balancing a checkbook. (These are all things I learned from Momma) Regardless, at the end of the day, Momma's poor feet were aching, and it was my job to relieve them. These days it seems I have turned my own kitchen into an intergalactic hub of sorts. There is always a fresh baked sweet, or two, or three, sitting on the counter waiting to greet far away travelers, and my counters are often covered in top secret documents of intrigue and interstellar importance (mail). But even in my late 20s, I quickly notice the toll of standing on hard vinyl flooring for too long. Old high school injuries begin to re-awake in the form of an aching knee, and the slight curvature of my back drags me down into poor posture and compressed vertebrae. Ironically, it's usually my feet that begin to ache last, but that makes them no less the source of my other woes. In our kitchen I keep a long plush carpet runner out to help pad some of the shock of hours spent standing at kitchen counters. I have long loathed the decision in decor; while it matched our black and red color scheme, it slides from one end of the floor to the next throughout the day. It is also made of carpeting, which has dense and shedding fibers that tend to trap fallen food debris and dust, to look quite dingy no matter how many times it's vacuumed. It quickly became clear it was time to invest in an anti-fatigue mat. When shopping for the right Comfort Mat for our home it was important to be well educated in the variety and functions. I could walk into my local Walmart and find a soft memory foam runner to toss in my kitchen, and while it would be cheap, I hardly doubt it would offer relief after hours of standing. 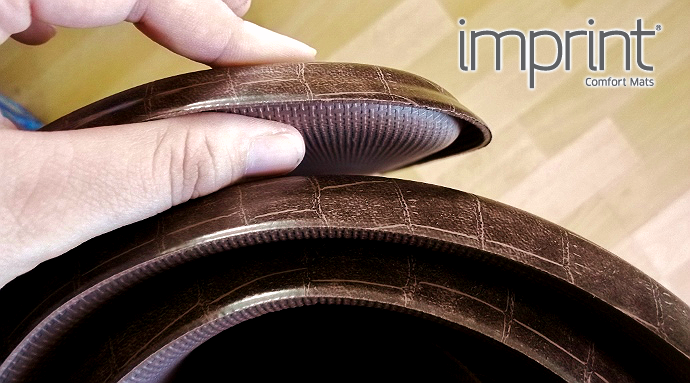 Investing in an anti-fatigue mat of quality will cost a little bit of money, but quality brands like Imprint offer extended warranties with their top of the line ranges, such as the Cumulus9. Available in 3 standard rectangular sizes, as well as 3 patterns and multiple modern decor colors, the Cumulus9 Imprint Comfort Mat features some of the top of the line university tested compounds and technology. In addition to a 7 year warranty and anti-curl commitment, the dual layered anti-fatigue mat has been proven to reduce overall fatigue and discomfort by up to 60%. I was recently sent an Island Runner Cumulus9 in Cajun Coffee Croco for a feature here on Momma Told Me. Our 6" long Cumulus9 Imprint mat arrived in a fairly compact, yet heavy, windowed box. I had an immediate concern regarding potential wrinkling and 'curling' from having been packaged rolled for transport. As I pulled the hefty anti-fatigue mat out of the box I was surprised to find there was no chemical odor. It turns out the Cumulus9 technology is manufactured using what the brand calls 'Eco9 technology,' that is environmentally friendly and non-toxic. Once on the floor, the two ends began to curl under; this was easily remedied with one simple roll the contrary direction. While some immediate visible storage wrinkles were evident on the surface (though hardly discernible amid the faux croco pattern), these worked their own way out over the course of the first 24 hours. I was also quite glad to find no additional stick runner was needed underneath the Cumulus9, which has stayed in place through weeks of constant use. In general, the range of Imprint comfort mats are also very design friendly; Sabrina walked into the kitchen and let out a gasp at first sight, "So fancy! Is that a real crocodile?" Of course it is not, but who can deny the whimsy of a 10 year old? When I hit the kitchen for a project I'm often on my feet for 4-5 hours at a time, and I usually experience the effects of fatigue after the first 2. The unique Cumulus9 multi-core composition features an immediately soothing soft upper layer, and a more supportive gel-like secondary layer to soothe and support arches and joints over time. Just standing on the mat for a few minutes, odd enough, does not seem to leave much of an imprint, however I can really notice the conforming cradle effect after 15 minutes or more of continued use. The easy to clean antimicrobial surface is also a blessing on it's own, wipe-able with most standard anti-bacterial kitchen cleansers, and a great gripping surface in a kitchen were messy spills can become quickly hazardous. 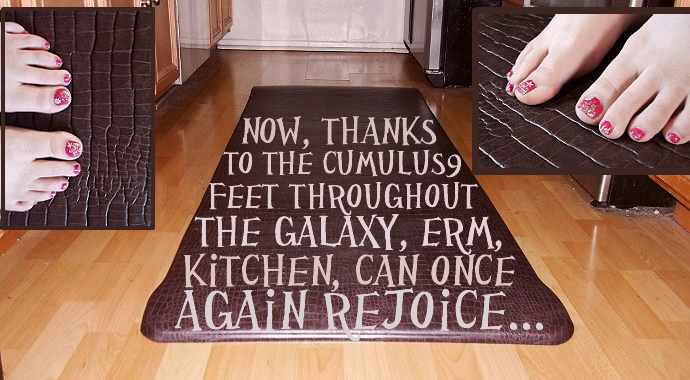 Overall I love standing on my Cumulus9 Imprint Comfort Mat; and am looking to invest in a second one of equal length, to cover the entire kitchen floor. For now, I drag the mat from the sink to the stove, depending on where I will be spending the majority of my time each day. Not only is the Cumulus9 an upgrade for my decor, but a lifesaver for my feet and joints! What Daughter Says: Don't punish yourself for hard work; invest in an anti-fatigue mat like the Cumulus9. 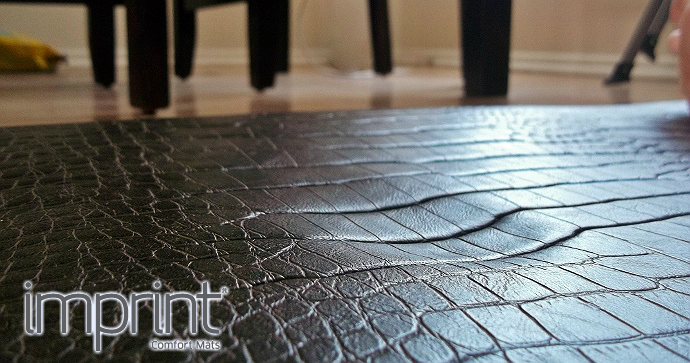 One Momma Told Me follower will win a Cumulus9 anti-fatigue mat from Imprint! I would choose the Nantucket in MOCHA! Ha! 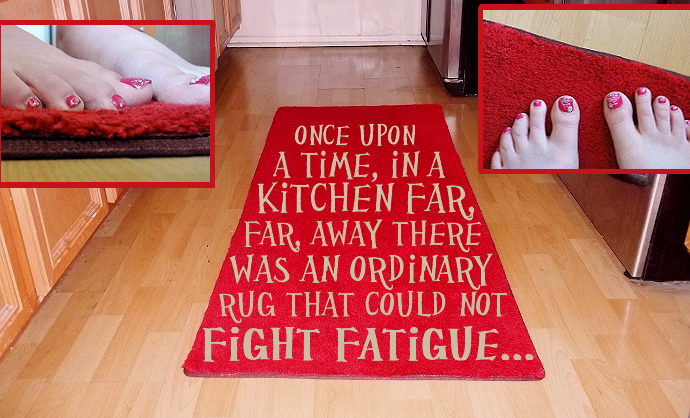 I have a similar mat, but it's too small, and was just talking about upgrading! I'd get the Cobblestone in Coffee. I like Cobblestone in Espresso. I like the cinnamon color in the Nantucket pattern. I would love the cobbletsone in espresso. It looks great! I would choose the cobblstone in black. I would get the Croco in Goose!! Love the Croco in Cajun Toffee!! I'd choose Nantucket in Cinnamon. I so need one of these. My husband who does the majority of the cooking is disabled and the time on his feet can get painful. I really like the Nantucket in Mocha. I would probably choose the Nantucket in Mocha or Black. This would be great for me since I have a back injury that causes me to have intense muscle spasms so the cushioning would help when cooking, doing dishes, etc. I'd choose black nantucket. This looks so comfy! I'd like the Cobblestone in Toffee. I like the Crocko pattern in the stone color. I'd choose the Cobblestone - Toffee one. Thanks. I think I'd pick the Nantucket in Cinnamon. I'd pick the Nantucket in Cinnamon. I'd choose the cobblestone in toffee. I would pick the Cobblestone in Espresso. I like the Cinnamon Nantucket. I like the Nantucket Cinnamon one! I like the cobblestone in Toffee. Nantucket Cinnamon is what I would choose for my aching feet. I'm really impressed with all the good looking options! I'm still trying to decide between the Croco in Goose or the Nantucket pattern in either Cinnamon or Flat Iron! I'd go with Nantucket in black! I would choose Nantucket Black.